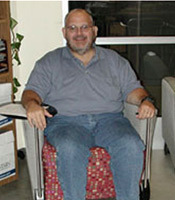 Douglas lost 205 lbs from April 2011 when he underwent Gastric Bypass. Now at 205 lbs. (June 2012) he is enjoying being healthy and active. 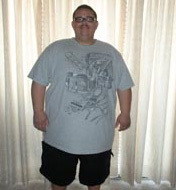 Bill explains his experience after having the gastric sleeve surgery and losing 102 lbs. in four months! I have always been a fat kid in school.I have been on countless diets through my life. I would lose weight, kept it off for a short period of time, then gained it all back plus some more. My husband and I decided to try to start a family in 2005. We tried for two years (2005-2007) but without success. I believe this was due to the fact that I was diagnosed with diabetes back in the early 2006. My highest weight was 225 pounds, a lot for someone who’s only 5’4”. I was on a medication for Diabetes and High Blood Pressure. My doctor believes that diabetes caused my irregular menstrual cycle. In September 2007, I was diagnosed with PCOS (Polycystic Ovary Syndrome). A cyst had formed on top of my nerves, with excess weight, the pressure pushes the cyst down on to the nerve, causing a sharp stomach pain. This is also a reason why my period was coming irregularly. I decided on Lapband surgery in the beginning of 2008. I had the procedure on May 12, 2008. Four months after the surgery I was down to about 185 pounds. My diabetes was gone. My period also started coming regularly. In October 2008, I found out that I was pregnant. I had gestational diabetes during my pregnancy. I gained a total of 40 lbs during the pregnancy (20 lbs in the last month alone). My daughter,Kayla Bree was born on May 26th, 2009. She weighed 10 lbs 9 oz. One week after she was born, I dropped 50 lbs. Kayla is doing very well. The pediatrician said that she developed fast compare to another baby her age. I truly believe that I would not be able to have kids if I had not had a Lap Band Surgery. “Dr. Owens truly saved my life. I have no doubt that the results of being morbidly obese would have ended my life. I had Lap band surgery on June 24th 2004, at the time I weighed 276 lbs...I have an ankle fusion and knee problems so the weight really caused great pain. I am currently 180lbs!!!!! I went from a size 26-28 to a current size of 14 and I am still losing. 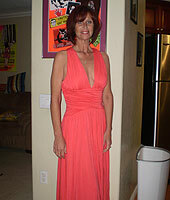 Since the weight loss I have so much energy and the joint pain has disappeared. Dr. Owens and his staff are wonderful, I have been seen at all 3 clinics, San Pedro, Chapman, and Alvarado. I have only great things to say about Dr. Owens as well as his staff. From reception to insurance as well as nursing his staff are professional and caring. Knowledgeable staff definitely makes the difference." "What a phenomenal year! On April Fools Day, 2003, Dr. Owens presented me with the gift of WLS. 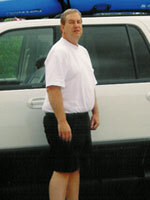 After a lifetime of being overweight graduating to morbid obesity, at the age of 51, my transformation began. I now maintain a weight loss of 110-115 lbs. and can’t wait to start each new day at peace with myself and my body. Words could never begin to express the love and appreciation in my heart and soul for the CCO surgeons and how they helped bring about the metamorphosis of ‘me’. Forever grateful!" September 5th, 2003 marked the turning point in my life along with the day of my Lap Band surgery. 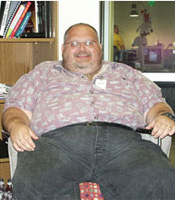 Prior to surgery I weighed 390 pounds. I had problems walking, sleeping and life was miserable. 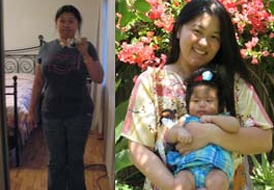 I tried everything to loose weight but long term success eluded me as the yo- yo effect saw a continued steady weight gain. I found Dr. Owens via the internet after researching local hospitals. His web site is awesome and explains everything. I attended the seminar then scheduled the required office visits. Blue Cross approved me for either procedure the Lap Band or Bypass. I own my own business and was concerned about down time so I elected for the Lap Band. I had the surgery on a Friday and was back at work Monday (typically more rest is recommended) feeling great. Weight loss was steady as I learned how to use my new tool. As of this writing I am down to 260 and have been stable for months. I am now able to return to past activities such as Kayaking and bicycle riding. I feel great and as my body continues to change and improve I will always remain grateful to Dr. Owens for helping me regain my life. "Dr. Owens saved my life. This surgery saved my life. From looking at 500 pounds in 2002 to looking at 200 pounds in 2003, the view has sure changed from hopeless to spectacular. As for finding the fountain of youth, if you are morbidly obese, look no further. My previous medicine regimen took about 2 hours taking the various pills, inhalers and sugar medicines, checking and rechecking blood sugar levels. I was on the highest levels of prednisone (45-65 mg) 3 times a day just to breath. I was in the emergency room so much, the DR's knew me by first name. Every visit would result in an admission, for at least 5 days and normally more. My average stay was 16 days at a time. Last time I was there, they didn't even recognize me until the wife showed the before and after photo. I don't even carry my inhaler anymore. When I say this saved my life, I really mean it!" 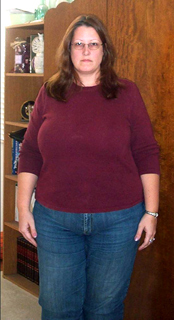 "My highest weight was 299 lbs (shown above). I weighed 288 lbs right before my surgery, and dropped down to 226.5 lbs 3 months post-op. My current weight is 158 lbs. I've lost a total of 140 lbs in one year: 15 inches off of my bust, 16 inches off of my waist, 20 inches off of hips - total inches lost 51. I went from a size 22W jean to a size 10. Thank you, Coastal!" 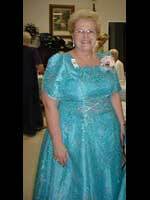 1 1/2 Years after I had Gastric Bypass Surgery I am 1/2 the women I use to be! 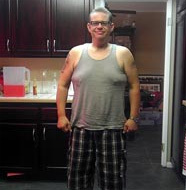 My starting weight on July 18, 2002 was 310lbs and I currently weigh 155lbs after losing 155lbs. 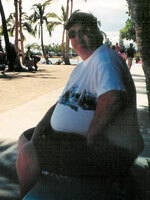 Back in 2002 other than being morbidly obese I had no other current medical conditions. However, my family medical background had drawn the picture of my future which would include Diabetes, High Blood Pressure, Cholesterol and eventually death. The only thing I had going for me was my age and that too was coming and going quickly. I knew I had to prevent what was going to happen to me if I stayed morbidly obese. That along with going on a business trip with my boss almost caused a near death experience for me . First, having to beg the flight attendant not to assign me a seat in the middle of two other passengers. Second, the humiliation of asking for a seatbelt extension and having to move to the last row of the plane. Third the refusal of food, although hungry, because the tray could not fold down and fourth having to keep up with boss as we had 2 minutes to get from one side of the airport to another. As I found myself trying to cover up my hard breathing so the boss wouldn't notice I thought to myself that was it, I had enough! On July 18th 2002 I would take control. Today, 18 months later I am still in control and have began phase two what I call the "Reconstructive" part of this journey. I recently had a Panniculectomy surgery in which 7 lbs of hanging skin was removed from below my belly button. Most people don't realize after you lose weight and even though I exercised I still required Reconstructive Surgery. The good news is that insurance covered this surgery due to medical reasons. I always tell others that Weight Loss Surgery is 25% losing the weight and 75% emotional. The further out from surgery I am the more I live and breathe that statement. I am 100% dependant on my re-trained healthy eating habits that were so important early on during the "honeymoon" stage of weight loss surgery. Yes, my pouch controls the portion but only I control what is made up of that portion this far out post op. For me its been pretty routine. Eat my protein, take my vitamins, exercise and drink water. I am also and advocate for Support Groups in person or on-line. In conclusion, I would like to thank Dr. Owens for giving me back what I didn't realize I had and that was my life! Before surgery my knees were giving out, I could not walk for any length of time because of severe back pain, and I had high blood pressure and cholesterol. I will never forget June 29th, 2004 (date of surgery). It was the beginning of a new life. I thank Dr. Owens for giving me a life I never had before. I have always had a weight problem, but was at the highest weight ever. 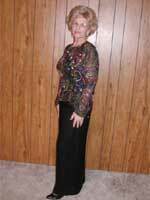 The decision to have the gastric bypass surgery was the best decision of my life. I would make the same choice again, and choosing Dr. Owens as my surgeon was another very good choice. I am now wearing sizes I never even thought of be able to wear, sizes 6-8. I enjoy walking again, and am able to be much more energetic than I have for a very long time. My doctor has reduced my blood pressure medication and I may be able to discontinue it altogether, my cholesterol is the lowest I’ve ever known it to be, and there is much less stress on my knees and back. Thank you Dr. Owens and the Coastal Center for Obesity nurses, staff and all of the people who made me feel so comfortable in my decision, surgery and recovery.